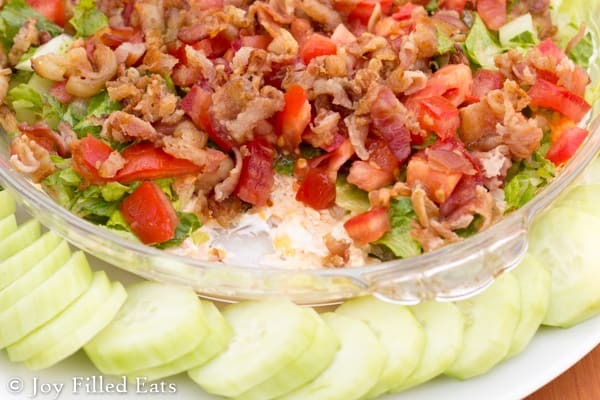 My fabulous BLT Dip has the flavors of a BLT sandwich in dip form. Perfect for a summer bbq or party. Or any other time of the year. 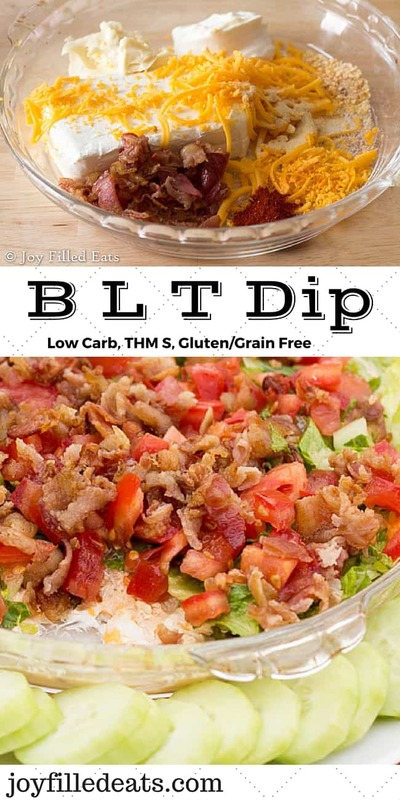 I was browsing Pinterest the other day and saw a photo for a BLT Dip. What the?? Oh yes. I clicked on it and skimmed the ingredients but it was a hot baked dip and this time of year I prefer dips cool or room temp. It gets too hot to eat hot food in the summer. I thought about that dip for the last couple days and knew I had to make one. I bought a pound of bacon this morning and cooked it in the oven until crisp. And just because I was curious I weighed it after cooking. 5.2 oz. I knew bacon cooked down a lot but that was ridiculous. It was only slight cheaper per pound then buying real bacon crumbles and so much more work. This was the cheapest bacon found at Walmart (Jonestown brand for $2.50 a lb) and Walmart also sells real crumbled bacon for $8 a lb. a 9 oz bag is $4.99. I also wonder if you get more bacon when you cook better brands. Costco has nice thick cut bacon for about $3.50 a pound. I’m going to buy it next time I’m there and cook and weigh that to see the difference. I think in the future I’m going to save myself the effort and just use the cooked bacon crumbles in recipes. I really can’t tell the difference in casseroles, salads, soups, and dips. 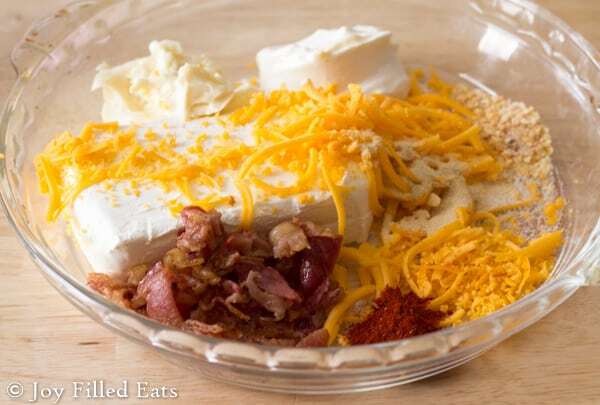 Combine 1/3 of the bacon with the cream cheese, sour cream, mayo, cheddar, and seasonings. Mix in a deep dish pie plate. Sprinkle on the lettuce, tomato, and the rest of the bacon. Serve with fresh veggies to dip. I wouldn't recommend that Mayo as it's made of canola oil ,food starch, maltrodexrin ,sugar, tapioca...etc. So much healthier to make your own. Also I'd like to know what "real bacon bits" from Walmart you used. I'm thinking about making this and spreading it on my low carb Pizza crust! We love BLT Pizza! Thanks for the recipe! Sounds delish! 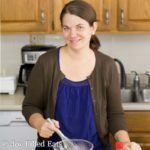 I'm new to Keto and need ideas for work lunches! I'm sure this will be perfect! Thanks! This was delicious! I was looking for a low carb snack and this truly hit the spot! I wouldn't have thought to use veggies for dipping into this if you hadn't suggested it. My husband ate some with crackers and I tried one and thought it was much better with the veggies. I will probably cut back on the paprika slightly when I make this again soon! Hi Taryn, I have a somewhat neat and easy solution to your shrinking bacon problem. I too buy my bacon at Walmart and I admit I flip the packs over to look at the fat and meat proportions. I now buy the thicker bacon and I look for a much higher meat to fat ratio. I must look like a crazy person going through an entire section and then picking 2 or 3 to take home. But here in Canada bacon is really a lot more expensive and it can be $4 to $15 easily a package so... pick I do. Also, the drippings from the bacon can be put in a jar beside the stove to use for sauteeing pan foods for your Keto diet. 50 lbs lost can't be wrong! We whipped up a batch of this for a TV dinner on a hot summer day for my husband and I who are new to the keto diet. Delicious, quick & filling enough to keep us happy without turning on the oven! Preparing for a beach trip....can the base of this dip be frozen? Good question. Cream cheese can get a bit of a funky texture when frozen and thawed. I don't think I would freeze it personally. Hi Taryn, This sounds amazing... I am really new to low carb cooking and this might sound odd, but what kind of veggies are good with this? Hi Becky, I like mild flavored ones so you can really taste the dip. Cucumbers or thinly sliced raw zucchini are my favorites. 1/12th of the recipe. I just eye it up. Hello, I have yet to make this. With those ingredients it is a perfect side dish. I want to know is there a way to store reiepes like this so not to loose them? Hi Valerie, You can save them on your Pinterest, bookmark the website, or print and store in a binder or folder. I use evernote, then I can pull them up on my phone in the grocery to make sure I have all the ingredients. I love a good dip recipe for the summer. Yum!! Hello, I made this dip for a family gathering yesterday and it was a hit! The recipe is now in circulation and will likely become a staple. I didn’t have paprika but no one could even tell something was missing. And the best part is how easy it was to throw together! Perfect for those last minute summertime get-togethers! I'm glad your family enjoyed it! Fabulous and delicious idea! 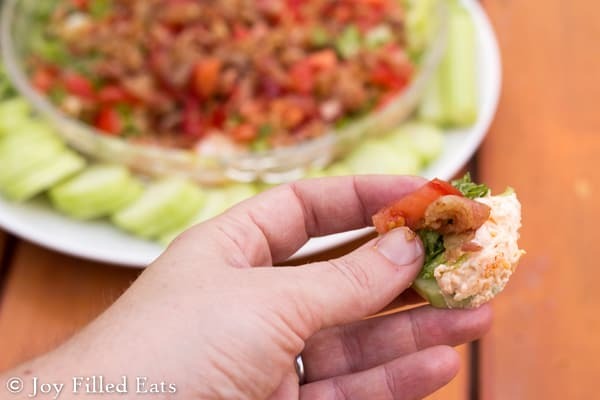 Who doesn't love a good BLT, now in dip form! 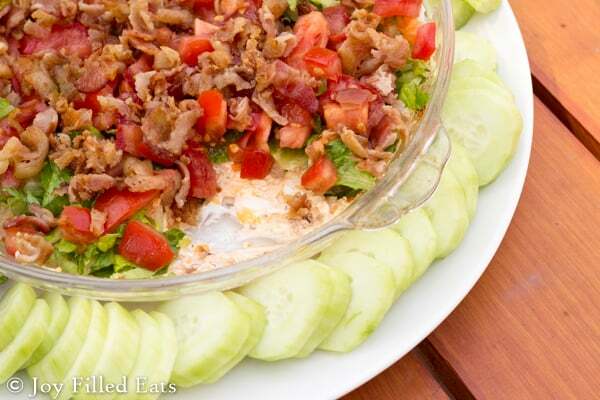 I could eat this entire bowl of BLT dip at one sitting. It's fantastic and reminds me of a BLT without the bread. 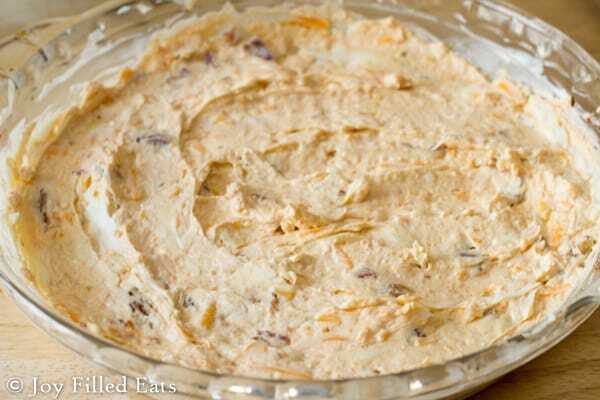 Such a great low carb dip and one that my husband is crazy about too. I like this without the lettuce and tomato on top. I used the pre cooked bacon and hot it really crispy (bacon crumbled from the store is weird and too chewy) I also added rosemary garlic seasoning. We love it!!! I just made this for a fundraising event this morning. The dip is quite tasty without all the toppings so I think it will be well received. I love that it's low carb but still protein packed (because, bacon!). One of my friends at this event is type-2 diabetic and another has celiac, so they should be happy campers! I took a screen shot of the recipe for anyone who has questions about what's in it because you can never be too careful these days! Looks like a lovely bbq side or a simple treat for the family at home. This sounds delicious! I don't usually comment before trying a recipe, but wanted to say ... one downside about buying bacon crumbles is that you wouldn't be getting any yummy bacon grease! ? This sounds amazing!! Been trying to find quick, easy ideas for camping this summer and this sounds like it would be right up my alley-I love cheese and hubby loves crispy bacon-marriage dip!! LOL!!! how much of this would you use for like lunch meal? I didn't really measure when I had it for lunch. Maybe 1/4 cup with veggies. 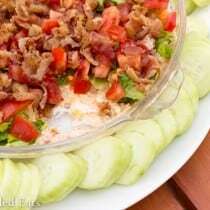 Hi Taryn, I just came across your recipe for BLT Dip and am making it right now, it sounds so amazing. I happen to have the Costco bacon on hand and am cooking it in my George Forman. I am constantly looking for low, no carb recipes and I know this wil be a hit!! !